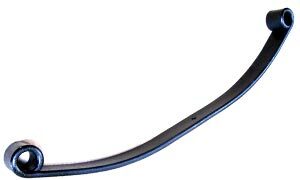 McAllister Spring manufactures all types of leaf springs from as small as a couple of pounds up to 1,500 Lbs. We’re also very proud of our transition to environmentally friendly induction heating for much of our processing. Give us a call and let us see if we can help you. Design help is always available. These types of springs typically have 3 to 10 leaves in total. They have rolled eyes at both ends with rubber bushings installed. They may also incorporate a second stage overload to deal with fully loaded trucks, while providing a softer ride when the truck is unloaded. Flex rates vary from about 250 Lbs/In up to 1,400 Lbs/In. 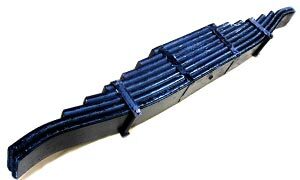 Most leaf springs are for rear applications but there are several common ones also available for 4x4 app’s where leaf springs may also be used. 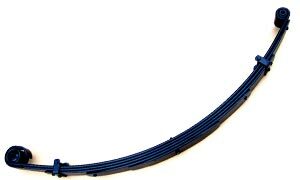 These incorporate both front and rear springs although front leaf springs are more common. 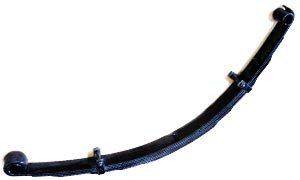 They may be a multi-leaf conventional spring or parabolic full-taper design. They typically use all metal threaded bushings or smooth bi-metal or brass bushings installed in front and rear eyes. 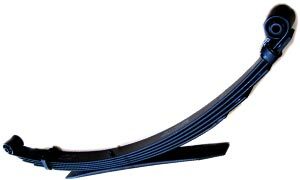 These are the big boys of leaf springs and the rears can weigh up to 1,500 Lbs per spring assembly. Typically, 5 to 12 Leaves per spring with a typical length of 6 feet or so. Material is typically 1” thick by 5” wide and up to 1-1/2” thick by 6” wide. Front springs are more typically in the 400 Lbs. range and usually incorporate 10 to 15 leaves. They may or may not be a slipper design based on application. These springs we make to order for specific applications. The designs vary considerably depending on the equipment. Some are a simple c-spring design but others use a fairly elaborate multi-leaf approach. Due to the repetitive high frequency nature of their work cycles, they all tend to have fairly thin leaves that are not subject to metal fatigue that would affect thicker springs. An interesting genre of springs which has been very popular for the last 10 to 15 years. A good percentage of small to medium truck owners are not happy with the stock OEM suspension. They typically want to raise or lower the vehicle and sometimes even increase the capacity. We start with the stock dimensions and modify them to the customers’ requirements. Sometimes we make a pair for one customer but runs of 200+ are common as well. 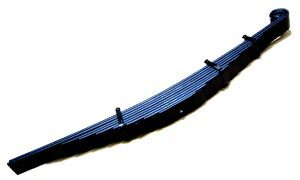 Overall, there is surprisingly consistent demand for modified PU truck springs. When truck springs are used for work such as loading yards of dirt or gravel, or mounting snow plows, winches and heavy bumpers on the truck, heavier rated springs are a common upgrade to increase the trucks capacity and performce with the added equipment. Other times, some people feel that the stock suspension is just too light for their needs. We have been making springs like these for many many decades and the demand does not seem to be diminishing. So long as we have sufficient information, we can generally help out in special projects like this. We’ve made special replacement springs for a Lamborghini, MGB roadster and a 1913 Mercedes, not to mention a 1917 Ford! We will occasionally receive a request to manufacture non-automotive designs for industrial or agricultural applications. We are always happy to help in all situations.